Do we behave rationally? You might be surprised how often our decision-making deviates from what is in our best interest. 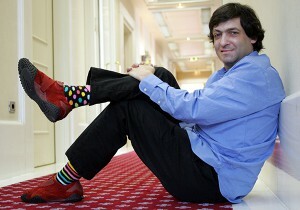 Behavioral economist Dan Ariely studies human behavior and decision-making. His experiments have led him to startling conclusions. He had this to say about climate change: “If you were starting from scratch, and you said, ‘Let me create a problem that people would not care about,’ it would look very much like global warming.” Listen to our conversation to find out why! This fun and fascinating conversation explores the decoy effect, inter-temporal choice, hedonic treadmill, identifiable victim effect, behavior substitution, the happiness conundrum, keeping up with the Joneses, and even being choosy about who you compare yourself too. After reading his first book, Predictably Irrational, I was very excited to sit down with Dan and explore the nooks and crannies of the human mind. It’s a great read, and I’m putting his newer book, The Honest Truth About Dishonesty: How We Lie to Everyone, Especially Ourselves, on my must-read list. I had this conversation with Dan in 2010 at a hotel in Boulder, Colorado, where he had a speaking engagement. It’s a fascinating journey into the human psyche. This is the 14th in our series of podcasts and radio programs. We post a new podcast episode every Thursday (we jumped the gun this week to avoid Thanksgiving). Be sure to subscribe! You can find us at iTunes, SoundCloud and Stitcher, or sign up to get an email every Thursday with the newest episode. If you like what you hear, please support this project with a tax-deductible donation. Your comments are invited below. Do you think human beings might somehow be capable of overcoming the limitations Ariely described and behaving rationally enough to avoid our most critical existential crises? David Brooks wrote about the climate change dilemma with some of the same conclusions as Ariely about human behavior, in this column in the New York Times: http://www.nytimes.com/2015/12/01/opinion/the-green-tech-solution.html?ref=opinion I don’t share his faith in technology or his modest estimation of the negative impact of climate disruption. But he does raise good points about the hurdles in front of us, and seems to be in alignment with Ariely about “behavior substitution” as perhaps the only way through this.